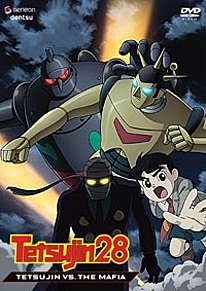 The American mafia arrives in Japan with the intention of stealing Tetsujin No. 28. But thanks to Shotaro's quick thinking they are put in their place. Kenji Murasame is willing to help them in their quest but soon discovers that the mafia has it's own agenda. Irritated by all this, Murasame aids Shotaro, but are his intentions entirely pure? Two fan friendly subtitle streams: Dialog & Screen Text, Screen Texts Only. DVD Features: Non-Credit Closing, Anamorphic Widescreen.